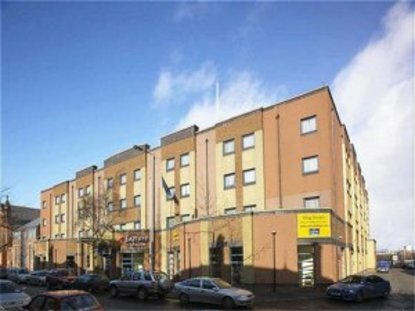 The Express by Holiday Inn Belfast is based in the centre of the university quarter near N.I. 's premier seat of learning Queen's university, the hotel is located in South Belfast, a 2 minute walk to Botanic Avenue part of Belfast's famous golden mile, where many of the city's residents frequent for entertainment in the plentiful restaurants, bars and clubs, that line the mile. The hotel is a short taxi ride from the George Best city airport (approx. #10) and international airport (approx. #23) and ferry terminals, and within walking distance of the city centre shopping precinct. The competitive room rates are inclusive of a large traditional cooked buffet breakfast which is served in the comfort of the Great Room by our friendly staff from 7am for those early risers. The hotel has very easy access from the M1 and M2 and is a perfect location for the business and leisure traveller. There is ample free parking for guests whilst staying at the hotel. There are six well equipped meeting rooms all located on the ground floor, seating up to 120 people. There is a bar and restaurant serving good food at sensible prices and all charges can be put onto a room account. The bedrooms are attractively designed and all are ensuite and have cable TV, modem points, High Speed Wireless Internet at a charge , power showers, hairdryers, tea and coffee facilities, telephones and in-room movies.